There was an existing covered area that was too small and was getting old and worn out. We removed this entire structure and expanded the space. 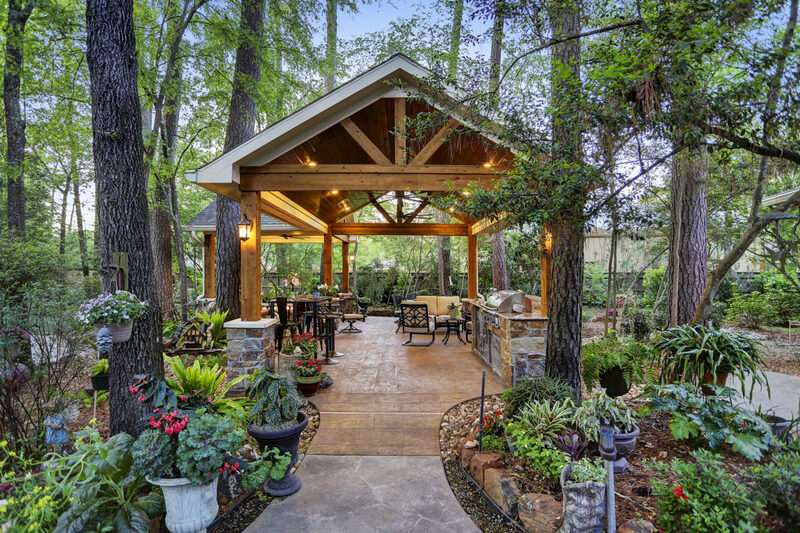 The new freestanding patio cover we created sits nestled between all the wonderful trees that this backyard has. It is a total of 424 SF with 2 different rooms. This front room is 280 SF with space for dining, cooking and relaxing. The outdoor kitchen has plenty of space for the homeowner. It is equipped with a grill, storage drawers and a refrigerator. The stone fascia matches the stone on the base of the columns. The flooring is a stamped concrete with a wood bridge plank design. The secondary room of this project has a gas fire pit as the central focus. There is a seat wall for additional seating and the swing at the end is a replica of one that had been in the family. This space has vaulted ceilings and gabled roof to add to the openness of the structure. This outdoor retreat is a perfect setting to enjoy the outdoors.